On this day in 1677, a historic royal wedding took place at St. James's Palace in London. The groom was the Stadtholder of the Netherlands, better known to history as the Prince of Orange. The bride was the niece of the English king. Both were grandchildren of King Charles I, who had been beheaded thirty years earlier. At the time of the wedding, William and Mary were fourth and second in line to the British throne, but only twelve years later, they were being jointly crowned at Westminster Abbey. William and Mary are the only co-monarchs in English/British history. They're still the only two people to have been jointly crowned as rulers. Because of this, their 1689 coronation posed a unique problem: the nation only had one set of coronation regalia. After the restoration of the monarchy in 1661, a shiny new set of regalia had been made for King Charles II by Sir Robert Viner. The 1661 regalia would be used by the new King William III, but Queen Mary II -- who actually had the better claim to the throne -- would need a different set to use. The consort's regalia, which had been made in 1685 for Mary's stepmother, Mary of Modena, wouldn't do. Mary II wasn't being crowned as a consort. She was a monarch in her own right, and she would need a set of regalia equal to that of her husband. The men charged with planning William and Mary's coronation faced a major time crunch. 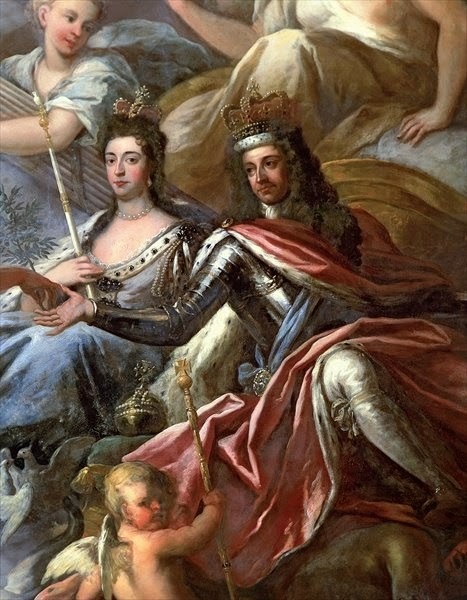 They'd gained power after the deposition of her father, James II, during the Glorious Revolution of 1688, and their supporters wanted them to be crowned as soon as possible to cement their legitimacy as monarchs. They needed to plan an elaborate ceremony, organize a mass of peers, and even carve a second wooden coronation chair for Mary. Because of the quick turnaround, parts of Mary's regalia ultimately were repurposed from Mary of Modena's set. Both of the crowns used by Mary II during her coronation had been made in 1685 for Mary of Modena. During the portions of the coronation ceremony when William III wore the Imperial State Crown made for Charles II in 1661, Mary II wore the state crown made in 1685 by Richard de Beauvoir for Mary of Modena. That state crown is now on display at the Tower of London. William III was crowned with St. Edward's Crown; Mary II was simultaneously crowned with Mary of Modena's coronation crown. 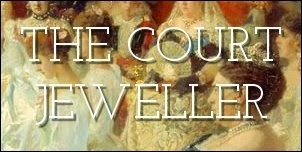 While the state crown of 1685 remains today much as it was when it was made (albeit without the same gemstones), the coronation crown has been significantly altered over the centuries. It's currently in the collection of the Museum of London, where it is displayed with imitation gemstones. When it came to the two other most important items used by the sovereign during the coronation -- the sceptre and the orb -- completely new pieces had to be made for Mary II. Mary's golden orb is a smaller version of the sovereign's orb; it was set with diamonds, pearls, and other gemstones then, but now it's set with imitation stones. The golden sceptre that she carried was topped by a white enamel dove with outstretched wings. While the orb was scaled down for her, the sceptre was about the same size as the one carried by William III -- as Anna Keay notes, "Mary II was considerably taller than William III, and her sceptre was at least as long as his" . Both of these pieces are in the Tower of London today, and they're not used anymore. In fact, the last time Mary II's orb was used in public was at the funeral of Queen Victoria in 1901, when both of the orbs were placed atop her coffin. 1. See Keay, The Crown Jewels, p. 113.